Bearish naysayers say the U.S. economy isn't accelerating. They say economic data fueling investor exuberance, like measures of confidence, is “soft data" and this optimism hasn’t translated into tangible economic growth. That’s not true. As we discussed this morning, Earnings Season is ending with a bang (so far, Nasdaq earnings per share growth is up +17.3% year-over-year). And consumption capacity is strong. How about this for hard data? 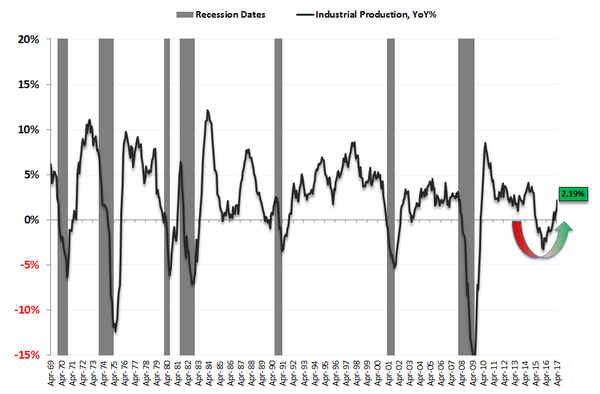 Today US Industrial Production accelerated to 2.2% year-over-year, a 28-month high. Remember, that's after year-over-year growth in Industrial Production declined for 20 straight months, from April 2015 to November 2016, before turning the corner. Takeaway: The U.S. economy is accelerating.